Sunday at ASH brought us 4 more CoMMpass oral presentations. Our first presentation was supported by the MMRF Answer Fund and focused on identification of high-risk myeloma patients—those patients who will relapse or die within two years. 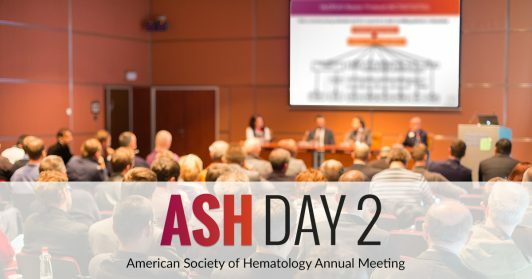 Dr. Benjamin Barwick of the Winship Cancer Institute in Atlanta, Georgia analyzed genomic sequences from 826 newly diagnosed myeloma patients from the CoMMpass study to tease out any genomic factors that contribute to poor outcomes (ABSTRACT 405 https://ash.confex.com/ash/2018/webprogram/Paper113585.html). Dr. Barwick and colleagues found that translocations (that is, when segments of 2 chromosomes switch positions)—namely in the IgH and MYC regions—are the most significant structural changes that occur in patients. However, these particular translocations are not associated with poor outcomes. It was the third most commonly translocated region—found at the IgL locus—that was associated with poor survival. They found that patients with the IgL-translocation do not benefit from treatment with immunomodulatory drugs (such as Revlimid). These results suggest that the IgL translocation may serve as a marker for high-risk disease and poor prognosis and are important new insights into identifying a previously unknown group of patients at high risk for disease progression. Dr. Yu-Hsiu Lin from the University of California, San Francisco analyzed plasma cells obtained from the CoMMpass trial to measure tumor cell signaling activity and identify signaling pathways that drive myeloma cell growth and survival (ABSTRACT 469 https://ash.confex.com/ash/2018/webprogram/Paper113683.html). Dr.Lin found that a pathway called the MAP kinase (MAPK) pathway is dysregulated in myeloma cells. This pathway is important for cell division and represents one of the arms studies in the MMRF MyDrug Trial. These results suggest that drugs that target the myeloma cell microenvironment or cell division pathways may be useful strategies for patients with high LDH levels.